What do you say? This Thursday, Alan will respond to this challenge and tell you how you did this week. Makes me wonder how many people would screen if we started destroying all of the eggs from chickens, or crushing all the acorns. How many would scream and say, that we are killing a species, or destroying the forest. As far as the dress one…. well who ever put that in there must have been wanting the poster to be square because it makes no sense in relation to the rest. And the unfertilized egg needs the sperm to start conception. These are all seeds that if nurtured will become that which the sign claims they are not. A seed is a stage of development. If we are to equate a fully developed and functioning human with a finished dress, then why do we not see humans who are out of style in consignment stores? If humans are the same as chickens, why are we not cannibals? If humans are the same as trees, why do we not kill an undesired one and replace it with one more preferable? If humanity has not been given any special value over other life on the planet, The question turns to equal rights for clothing under the law and the curiosities posed above can only be answered by emotive blabberings that mean nothing in reality. Humans have an intrinsic value given to us by God, and God has not given this value to a dress (or the other animals or the plants, for that matter). If we are to equate humanity with these, they should be treated with the same (lack of) dignity. The acorn is not a tree, but it IS an oak. The same logic applied to me right at fertilization: I wasn’t a human adult, but I most certainly WAS a human person. The clever manipulation of the facts doesn’t address the issue. The issue is simply of capacities. 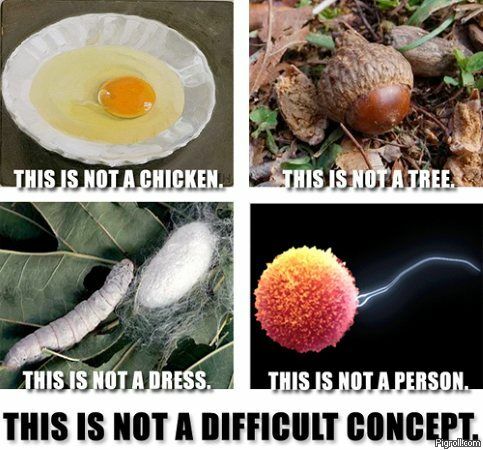 Just because an “egg” does not encompass the capacities of a adult chicken doesn’t mean it’s not a chicken. Defining when life begins is the most difficult aspect of the pro-choice dilemma. A “red herring” display like this only diverts attention away from the actual debate. How do you define personhood? Why not place an aborted fetus on the sign with the caption, THIS IS NOT CHILD ABUSE! At conception, the embryo possesses lower order capacities. When given the proper environment and nutrients, just as the acorn pictured above, the embryo will grow and develop higher ordered capacities. The acorn when planted, watered, etc… will grow to produce more acorns. Why not place mentally retarded children, disabled children, disabled elderly, etc. on the above sign with the same caption. The same argument could be made. This sign is an obvious diversion from the facts and illustrates the depravity of society. The responses given so far are great! All I would add is this. The difference between a separate egg and sperm, and what they are immediately after they join, is immense. Before, each represents 1/2 of a potential person. After, you have a complete human, just not one we recognize with our eyes. What was once a potential human, is now completed, recognized by God. And the silk cocoon is not like the others, in that it is not a living thing. It will not become anything, left on its own. It is a raw material used by people to create thread and fabric. You might just as well have pictured a 2×4 or a lump of pottery clay. All previous responses pretty much say it all…just because each of the above are not in their final stage of development doesn’t mean they couldn’t be if given proper care,nutrition and time to grow. Abortion ends that chance when a blastocyst,embryo or fetus are destroyed and removed. Once a sperm unites with an egg and are fertilized in the womb or via IVF they combine to make a complete human being with all 46 chromosomes and the DNA of a human being. We all started at the earliest stage of development and if we were aborted none of us would be here. Abortion is murder of an innocent human being simply because of their location and mental/physical development. We need to create a culture of life so that all human life is respected from conception to natural death, otherwise you follow a slippery slope by saying someone with lesser physical or mental capacity has less value. All human life should be treated with equal value and protection. I’ve got to hand the poster credit. If they wanted to dehumanize the unborn, then using the ‘not a dress’ one is pretty interesting. However, it’s also a massive red herring. For the first two, it’s very simple to say that yes, they are chickens or trees, just in their earliest stages of development. Just because they call it an egg or an acorn doesn’t mean that it can’t eventually grow into either a fully grown chicken or tree. It’s simply early in their developmental cycle. The silk (at least I think that’s silk) however isn’t a dress. However, this is because silk isn’t alive. It doesn’t grow into anything. It’s made into something. Amongst the images, it doesn’t make any sense. The fertilized egg, however, is just like the previous two though. It is alive and it is simply early on in its developmental cycle. It’s still human. And because it’s human, it should be afforded all of the rights that humans get. Sean, you’re exactly right. The silk picture isn’t applicable at all because it’s a construction scenario, not a development one. Here’s an article that explains the difference. Wow, everybody here said pretty much what I would say. It seems the poster is trying to play on the old “potential” life argument and I think everyone here answered that very well. I will just comment on something Carlin alluded to: I can’t help but notice how they try to get so much mileage from the word “person” as opposed to simply saying “human.” Anytime you try to get a definition about what constitutes a “person” you end up with a list of arbitrary qualities (usually developmental in nature). If we are assigning value based on arbitrary qualities (like your SLED test reveals), I fear for the lives of more than just the unborn. I also like what Lyle said: “Check the DNA.” Even if you grant that personhood is based on arbitrary qualities, the unborn is still most assuredly a human life. If you replace “This is not a Person” with “This is not a Human” you can see clearly that it would be scientifically false and the poster would lose it’s rhetorical flare. This is not true… this is propaganda. Some choose to see things for what they are not; others for what they are.